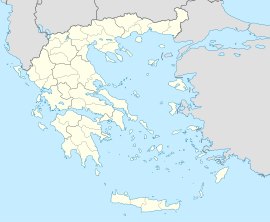 Anogeia (Ανώγεια) is a municipality in the Rethymno regional unit, Crete, Greece. The municipality has an area of 102.632 km2 (39.626 sq mi). Population 2,379 (2011). When exactly Anogeia was founded and by whom, is not accurately known. Many[who?] believe that the original settlement was founded by villagers from the village Axos, which is west of Anogia, where the Minoan city Oaxos was. According to a legend, a shepherd from Axos found one day on one of the slopes of Psiloreitis an icon depicting Saint John the Baptist. Pious as he was, he picked it up carefully, wrapped it in a towel, took it to his home and placed it there alongside the other icons. On the following day he was astonished to find out that the icon had disappeared. Terrified, he went back to the place he had found it on the day before, where he was exhilarated to discover that the icon was exactly at the same place. This inexplicable phenomenon was considered to be an order from the heavens, to build there a temple dedicated to Saint John the Baptist. The historian Stelios Spanakis, summarily provides geographical, as well as historical information about Anogia,: “Anogia is a town –municipality in the Mylopotamos Province of the Prefecture of Rethymno. In the 1981 census it numbered 2.449 citizens. It is in the northern reaches of Psiloreitis, at an altitude of 700-790 meters. When in 1182 Crete was divided among the 12 Young Princes of Byzantium, Anogia were given to the family of Fokas. Anogia are referred to by Venetian and Greek scholars and historians as Anogia, or Anoia. In 1593 it was already a significant settlement, numbering 911 citizens. Anogia are referred to as a revolutionary place during the years of Turkish occupation. In 1822, when the Anogians were fighting the Turks in Messara, Serif Pasha found the village empty and put it to the torch. In November 1866, during the Great Cretan Revolt, Resit Pasha tried to capture Anogia, but he was repulsed by the Anogians and other villagers from Mylopotamos.”  This tradition continued during the German occupation and in August 1944 the village was once again razed to the ground in reprisal for the local's participation in the resistance. The living conditions of the people of Anogia, as well as those of other mountain villages in Crete, were extremely difficult. Anogians of old times were mainly shepherds, goatherds and not so many of them were farmers. The barren soil, the harsh winters, the frequent revolts and the constant purges from the conquerors contributed to the primitive living conditions, to the great poverty and the lack of even the most basic of comforts. The French historian Victor Berard (1897) during his journeys in Crete, dedicated but a few lines for the village of Anogia, where with a raw and laconic way describes the hopeless living conditions of the time: “The village Anogia, resembles the outposts on the remote peaks of old, where men and animals live together in miserable hovels”. The Italian Vittorio Simonelli who visited Crete in 1893, was much more generous in his descriptions. First, he was put up at a “tolerable inn”. As for the villagers themselves, both men and women, made a great impression on him, when on a Sunday he saw them going to the church. He wrote: “Anogian women are beautiful, with red cheeks and faces that are lit up by eyes black and shiny, like agate. Their traditional clothing, accentuates the health and beauty that characterize the ancient Cretan archetype. The men are also handsome, being tall, lean, and easy in their movement, proud, but without even a trace of ferociousness”. In recent years, the Yakinthia (Hyacinthia) cultural festival is held at an altitude of 1200m in the Nida Plateau, south of Anogeia. The festival is held annually every July and focuses on the Cretan folk tradition and its blending with the traditions of Greece and the Mediterranean. In 1941 in Anogia, the 'Liberation Action Committee' was founded. Anogia was the core of the Resistance in Crete and the abduction of General Kreipe took place in Anogia and the evacuation to take him to Cairo was orchestrated there. In retaliation, on August 13, 1944, the commander of Fortress Crete Müller ordered the demolition of Anogia and annihilation of every male from Anogia in a radius of 1 kilometre. Thus, on August 13 of 1944, three battalions of German troops surrounded Anogia and set garrisons in the surrounding hills. They arrested 80 elders and sent them to Heraklion and executed nine disabled persons, all others were evacuated to the surrounding mountains. They blew up every single house with dynamite, and started an arson, about 800 houses became rubble and they burned 6 elderly disabled women. The remaining men fled to Mount Psiloritis to safety. Between 1941 and 1944, during the fight against the German invaders, a total of 104 Anogians were killed . In 1946, the state honored Anogia with the award of the War Cross first class for the disasters which affected and for their heroism. The following year, the community, honoris causa, was recognized as Anogeia. Wikivoyage has a travel guide for Anogeia. Wikimedia Commons has media related to Anogeia. ^ "Population & housing census 2001 (incl. area and average elevation)" (PDF) (in Greek). National Statistical Service of Greece. Archived from the original (PDF) on 2015-09-21. , excluding the former municipal departments Axos and Zoniana. This page was last edited on 14 February 2019, at 19:04 (UTC).